What’s the most exciting, memorable part of renting your place? Throwing a killer apartment party! 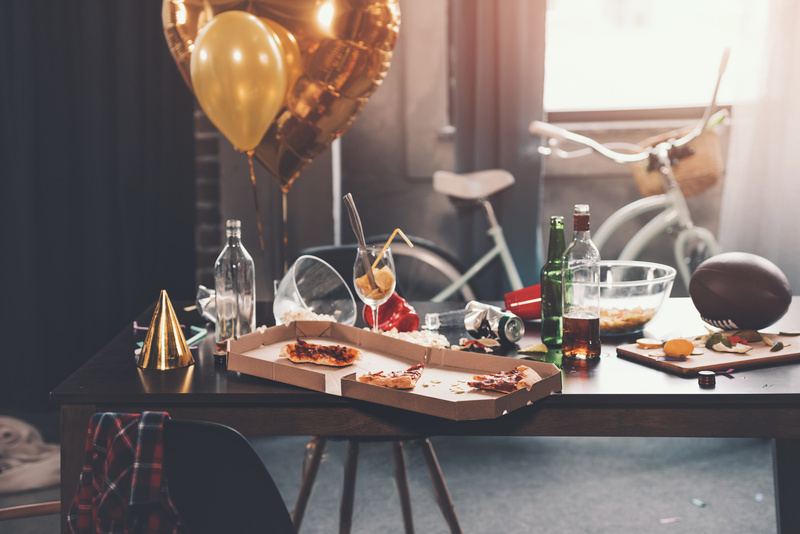 Throwing a party in an apartment can be a great time – all you need is the right people, some great snacks, and fun activities. But be sure to be mindful of the noise as not to disturb your neighbors! There are many different types of parties you can throw depending on the size of your place and the number of people you want to invite. In summer, it’s particularly fun to create a summer motif to inspire thoughts of a tropical paradise! Who doesn’t love palm trees, sunshine, and other fun tropical elements that are commonly used in summertime party decorations? Feel free to get colorful and incorporate a brighter palette. You can use tablecloths, curtains, streamers, even summer-inspired plates, and napkins. If your party is being thrown for a specific holiday, it will be easier to plan the aesthetic. You can find plenty of information and inspiration about almost any holiday on the web. Typical summer meals involve barbecues, fresh fruit, and light, refreshing drinks. You could include a crackers station or get different kinds of vegetables to serve as finger foods. For alcoholic drinks, a good mojito or wine cooler is an excellent choice. You could also serve tea or your own custom juice creation. If you’re thinking about cooking or mixing something adventurous, it may be helpful to try it out in advance before the actual party! Music makes almost everything better – including your summer apartment party! Like the other elements of your get-together, the jams you choose to listen to can be decided based on the tastes of you and your guests. Some people enjoy pop music, while others are into summer rap anthems or country music. Artists like Jimmy Buffett, Jack Johnson, Tom Petty, and Lynyrd Skynyrd are some of the most popular soundtracks for the warmer months of the year. Everyone loves to play party games, especially when hanging with their loved ones at a summer gathering! Have a limbo contest or play beach ball volleyball. 5. Go With A Theme! Theme parties are a great way to add a touch of Summer to your party. Throw a luau or tropical theme. Or have a beach theme. Enjoy your party and your Summer!